Huntingdoor presents “Mongolian Style bow – 55” Traditional Recurve Hunting Longbow” is similar to the Manchu bow, a type of composite bow. The characteristics like large siyahs, prolix draw length, noticeable string bridges, and use large and heavy arrows of Manchu bow are perfectly match with today’s Huntingdoor 55" longbow. The Manchu bow traditionally used in Manchuria, and afterward spread to China, Mongolia, and Tibet in the course of the Qing dynasty. Hence, if you like to see yourself in that ancient state, then you can collect this impressive Huntingdoor 55" Mongolian style recurve bow. This solid one-piece bow entirely crafted by hand and intended for those who could manage a longbow efficiently as well as loves the traditional look. 30#, 35#, 40#, 45#, 55#, &60#. The riser of this Mongolian style bow is an integrated composite center shot type which made of best quality Asian Red beech or Acacia wood. The 55" bow is a perfect length for a standard height archer to grip it easily and comfortable shooting. As it’s a single piece bow, you can avoid the hassle of assembling and disassembling. Moreover, it supports both right-handed and left-handed person to shoot. 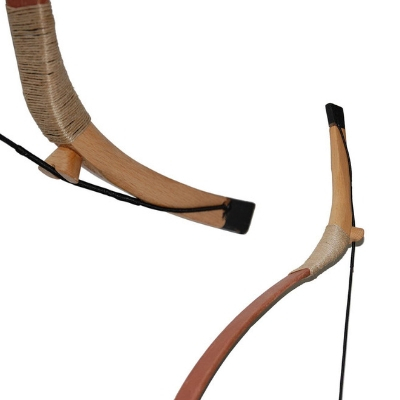 Similar to most of the bows available in the market, you have not to think much about the hand orientation. Using of durable traditional materials and handcraft makes the bow an outstanding shooting longbow — the limbs of Huntingdoor made of wood and covered with high strength transparent epoxy resin fiberglass sheet which makes it flexible enough to get maximum draw length easily. It is also suitable for use in all-weather condition. Huntingdoor 55" is a great hunting bow comes with draw weights ranging from 30 to 60 pounds. It is also an excellent forgiving bow allow 2-3cm measurement error during hunting. Hence, you use this bow to hunt any game like deer or elk or wild turkey with effortlessly. Longbow usually tricky to handle, but this Huntingdoor small weights 30+ pounds allow young archer 18+ years to shoot with this. So, you have the option to choose the draw weights according to your stature. Durable but lightweight longbow comes with high stability and comfortable grip which allows you accurate shooting. This traditional recurve style bow can generate excellent arrow speed which is perfect for fly-in or remote-area hunting. However, because of one piece bow, it is a little difficult to carry long distance in the woods. As like other longbows it will also not allow any attachments as it is difficult to drill. However, it comes with a pre-set string. For hunting game arrow always play a significant role. If you choose the Huntingdoor longbow, you will not think much about what type of arrow you should buy. Because, Huntingdoor itself is a master to manufacturing different kinds of arrows like broadhead, carbon, wooden and bamboo shaft. Once you measure the arrow length which depends on your draw length, you can buy your choiceable one from Huntingdoor store. Q1: Could I hunt deer with this bow? Ans. : Yes. If you use 45 to 60-pounds draw weight Huntingdoor bow, you can straightforwardly shoot a deer. Q2: Is it a shelf less bow? Ans. : Yes. It is a shelf less bow, but without a shelf or rest, you can drat arrows with high speed. Q3: Is this suitable for a beginner? Ans. : No. It is absolutely a hunting bow and required high technique to handle it smoothly. You can occasionally practice target shooting too with this bow. Q4: What is the brace height of this bow? Ans. : The brace height is 7-inch or 17.5cm. Q5: Based on which length draw weight is measured? Solution: For any assistance, you can write to the sales team of Huntingdoor. Moreover, you can check the process on YouTube or from expert archers too. If you like to draw a bit extra and are a tall man, then you go for Hungarian Longbow which comes with a wide range of draw weights from 20 pounds to 110 pounds and 57" draw length. Hungarian longbow is also a multifunctional bow allow you to hunt, target shooting competition and practice simultaneously. It also allows children and adult women to dart. However, both the bow made with almost the same materials but the Hungarian charge a bit extra for its features. So, if you have not a budget crisis and you want it for your child, then you go for Hungarian bow. Otherwise, Huntingdoor is an excellent choice for your budget. Above all, if you are a professional hunter and love the traditional handcrafted bow, then you go for “Mongolian Style bow – 55” Traditional Recurve Hunting Longbow” without thinking twice. It is an excellent bow regarding its forgiving nature and arrow speed along with high stability. Now it is your turn.